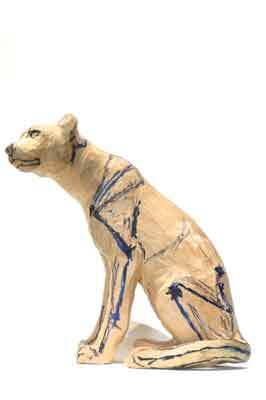 There are many considerations to bear in mind to carve something like a cheetah. Just because a big cat has spots, it doesn't necessarily mean that it is a cheetah or a leopard, as there are many spotted cats and they are all different. Also, your carving will give no idea of actual size and, unless you paint the finished piece you won't be able to show spots. Although you have a pattern to go by you will need to spend some time acquainting yourself with what a cheetah actually looks like. You will need not only to capture the shape of the animal but also its essence or character if you are to be successful. There are many books and thousands of photographs on the internet that you can study at your leisure. One picture that will be invaluable is that of the skeleton. From this you can work out the proportions of the animal â€“ I usually do this by translating each dimension into 'heads'. I measure the head and then check this against all the other dimensions, bearing in mind where each joint is situated so that I can check these against my carving. 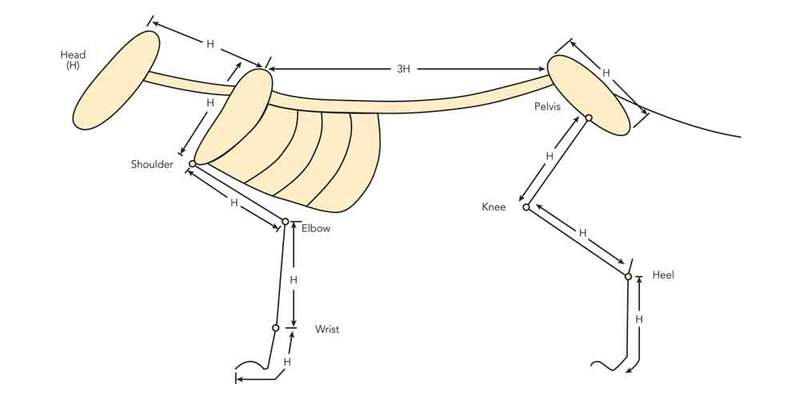 The following diagram gives you the relative dimensions for the cheetah. 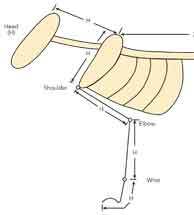 Once you understand the basic structure you will see that the same bones and muscles are shared by all four-footed animals and you just need to see how these vary in length and proportion for any one that you may wish to carve. Very often, by slightly exaggerating some of the features, you can make it easier to see the difference. One of the common features of the cheetah is it sits very tall and stretches its neck out to search for possible enemies. I have very slightly increased the length of the back and neck to emphasise this feature. If you don't like this you can stick rigidly to the correct proportions. Once you have done all your homework I recommend that you make a very basic maquette from clay or Plasticine. 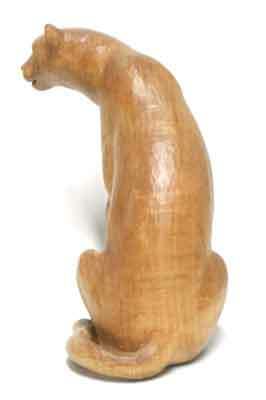 I have known carvers who make their maquettes from soft wood like jelutong (Dyera costulata) - the choice is yours. This doesn't have to be detailed but, by using the patterns given, you should get the basic shape and lines of action of the cheetah. This will give you a good basis to work from when you have transferred the patterns to your block. I have used a piece of lime (Tilia vulgaris) 150 x 150 x 100mm for my carving. If you have a bandsaw, you should be able to cut out the outline from the side, but you may not be able to do the same with the rear outline. This could be cut with a coping saw or even attacked with a mallet and gouge. This is not a step-by-step project as each of you will have your own way of carving it but you may like to consider some of the following tips. 1. Don't 'practise' on your carving - this is what your maquette is for. If you are not sure of anything, try it on your maquette first. I like to develop the maquette as I progress with the carving - if an idea doesn't work on the maquette, it won't work on the carving. 2. Keep your pencil handy - it is your most valuable tool - and draw what you intend to carve before cutting wood. 3. Before you cut any wood, make sure you mark in the position of the head and neck, remembering that the head cannot bend even if the neck does; it is a solid block. 4. Rough out the head before you attempt anything else and then try to get the rough form of the animal before attempting any detail. 5. 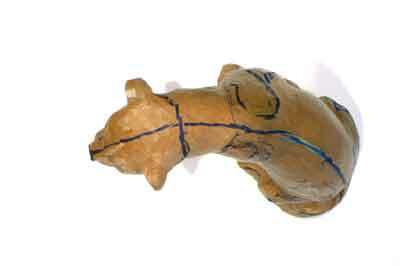 Throughout the carving, keep the centreline marked in with the position of the pelvis and shoulders drawn for reference. Remember that a line drawn from the left shoulder to the right, or from points on the opposite sides of the pelvis, will always cross this centreline at a right angle, no matter how much the centreline curves or bends. 6. Keep measuring the limbs, as it is very easy to carve 'by eye' and not get the lengths right. 7. Just because you are carving a specialised animal like the cheetah, you should not overlook other reference material that is close at hand. 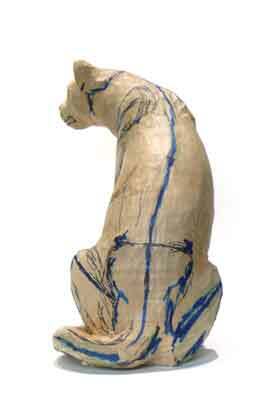 If you have a dog or cat, especially greyhounds, whippets or Siamese cats, you can easily see muscle forms that are very close to those needed for your carving and that can be checked regularly for accuracy. 8. Don't forget that the big cats have very loose bellies that expand and contract hugely depending on whether they have eaten or not. When sitting, this will hang quite low, giving quite a deep body outline. I have left this carving with a tooled finish, but you may wish to sand yours. Remember, though, once you start sanding you are doubling the time spent on the piece if you are to get a good finish. Even to get a good tooled finish takes quite a time as it is not just a matter of leaving tool marks; the finish has to be clean and sharp without 'fuzzies'. I find that the best finish to use with a tooled carving is Danish oil followed, if you wish, with a final polish with wax. Don't forget to wipe off any surplus oil before it dries or you can get a rather blotchy varnish-like finish. This project may look difficult to some carvers but, if you do your research and produce a reasonable maquette, a fairly capable hobby carver should complete this piece in less than 20 hours of carving time. Don't be disappointed if it takes longer, as you will learn a great deal about carving animals in general. Because I like to do most of my carvings like this holding them in my hands, my choice of tools will be a little different â€“ I use shorter tools â€“ but the sizes and sweeps will generally be the same.